Clemson, S.C.—Clemson sophomore kicker Greg Huegel is one of 20 semifinalists for the Lou Groza Award. The award is given each year to the top place kicker in college football. It is named in honor of the former Cleveland Browns great Lou Groza who played 21 years in the NFL. Huegel is one of just two ACC players on the list, as he is joined by Virginia Tech kicker Joey Slye. Huegel, a sophomore from Blythewood, S.C., has made 11 of 13 field goals and 32-33 extra points for a Clemson team best 65 points in 2016. He has made 85 percent of his attempts, including 3-4 from the 40-49 yard line. Last week he made three field goals at Florida State, including a 46-yarder in the fourth period that gave Clemson 29-28 lead. The Tigers eventually won 37-34. Huegel has also excelled in terms of kickoffs this year and is a major reason Clemson ranks fourth in the nation in fewest kickoff return yards allowed per attempt. He has 49 total kickoffs and 24 have been touchbacks. Opponents average just 14.8 yards per kickoff return against Huegel’s kickoffs so far this season. 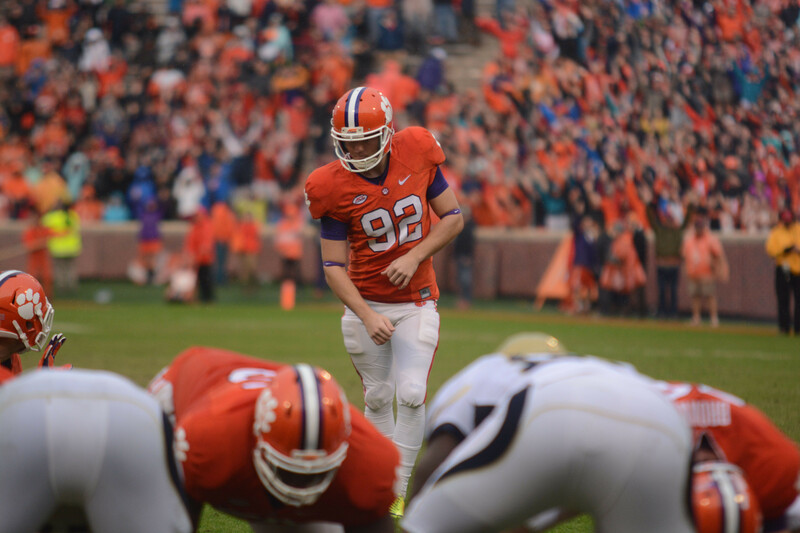 Huegel led the nation in field goals made last year with 27 in 32 attempts. He is now 38-45 for his career, .844 and has scored, 203 points, already 13th in Clemson history.